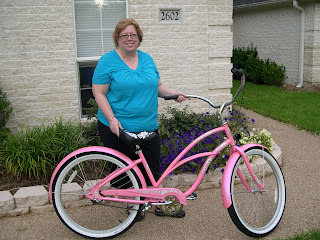 Just over a year ago, I became the proud owner of a pink Hawaiian Electra Cruiser bicycle. Longtime readers may remember the pink bicycle saga, chronicled here, here, here and here. Yes, I might have been a bit obsessive over it, what can I say?!? At the time, I had been on my diet for about five weeks and had lost a decent amount of weight - close to 20 pounds. I remember being so excited when the bike finally came in, and I had my husband take pictures of me standing proudly with my sweet new bike. I uploaded them to the computer, fully intending to post them on my blog. And then I got the shock of my life - I was huge! Still! But how could that be - I had lost nearly 20 pounds! I was wearing new, smaller clothes - a 2X top and size 22 capris - how in the world could I look so ginormous?!? And for comparison, here I am just over a year later - still not "there" yet, but a hell of a lot closer! Wearing a size M top and size 12 capris - and feeling pretty good about myself! To everyone out there, no matter how much you have to lose, how big you are...YOU CAN DO IT!!! Wow, that is quite a difference. Makes me a little uncomfortable to admit that after losing about 115 lbs, I'm down to your start size. I only hope I'll see a size 12 some day! oh,and the pink cruiser? I'm all about that myself! Aside from the amazing weight loss, you also look 10-15 years younger. Wow! I want to see that change in 1 year. I would love to wear a size 12. I was so happy to go from a 28 to a 22. I can't imagine what a 12 would feel like--its been 15 years! Wow--congratulations. It's amazing how losing weight also seems to take off the years. You look great and such an inspiration. Love the bike and you look awesome. Congratulations. you look fanTIZtastic and I totally and entirely and WHOLLY COVET your bike. Wow - what a difference a year makes! Congrats on all your hard work! Bathing suit-wise, I've shopped at LandsEnd, goggled Delta Burke stuff which brought me to a site I can't remember (but I don't know if that label makes them as small as size 12!!!!! ), LL Bean (very limited underwire if that's what you're looking for), and aerinrose.com......and still no luck. I hope you find something. The trip sounds wonderful! You look ah-maz-ing!!!! Seriously. And that bike is totally cute! What you have there is a before and after picture that will make people's chins drop. Your journey this past year has paid off - you look so happy, confident & beautiful!! And the bike is rad. You should send a link to this post to the Hawaiian Electra Cruiser bicycle manufacturer. You could be their model and spokesperson. I would be amazed if they didn't want to use you in their ad campaign! Thank you for the inspiration! You look fabulous! What an amazing accomplishment! I surprise myself sometimes when I am feeling strong and fit, then look in the mirror and realized...still 100 pounds to go. It is a harsh reality, but maybe in a year I will have great pictures to post!!! Seriously, jaw-dropping difference! You look so good and SO much happier!! Totally jealous of the bike too! You are an inspiration my dear! You did THAT in a year? Gawd. I'm in awe. And with I had stuck with it so I could be your twin, cuz right now I look like you did a year ago. Daunting reality check for this woman. You now look like your own thinner- and YOUNGER!! !- sister! Look how amazing and awesome you are! You look fantastic. And the bike is incredible. WOW. Congrats to you. You must feel SO GOOD. WOW. Thank you for sharing that, what a great dose of inspiration! You look fantastic! Wow ! You look amazing ! Congrats ! Shelley, you look great. You look like you are so close to goal. Do you ever post your weight. I'd like to see your numbers and how they've been over the year. Keep up the good work. Love the bike! Holy crap, girl. You look fantstic. You've melted away. Wow. Ah, to wear size 12. I'd be so happy. LOVE that bike so much. I mean really love. You're doing so great. Such an inspiration. Your before and after photos are so inspirational - you are looking great! And I love the bike. Who is that skinny chick with the bike?? Girl, you look so great!!! It's all about lifestyle changes! 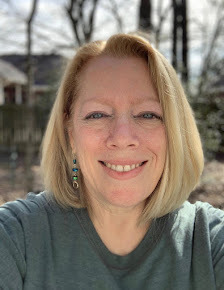 I hope you don't mind, I mentioned your post yesterday in my blog today with a link to your blog. That post really made me think! Holy cow, what an amazing difference in a year’s time, Shelley! Huge congrats to you on a fabulous job. You look so much younger--as if you could be your own daughter. As they already said - you look fantastic. And I love that the before is a smiling happy you too! Great job - definitely inspirational! You look great! (And I bet you feel great, too!) I had the same experience -- getting disappointed with how I looked after I already lost a fair amount of weight. I love your bike!!! Mine is pink too but I could not afford the Electra. You look fab Shelley and I agree you look A LOT younger. What a difference! You look great. Old pictures make me cringe, too - which I don't think is really a good thing. And you do look younger! Don't let old pictures make you cringe. You wouldn't be you now, without all the parts that had gone before. You look great! And I absolutely love your bike! I love your bike and you look great! I just saw this post today and omg! SO CUTE. That bike is adorable! And you look so awesome in the after pic! Good job!